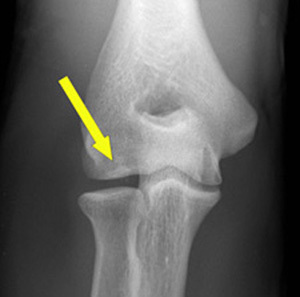 Osteochondritis Dissecans (OCD) is defined as an inflammatory pathology of bone and cartilage.This can result in localised necrosis and fragmentation of bone and cartilage. OCD of the elbow is most commonly seen in the sporting adolescent population (ages 12-14) in particular throwing sports or upper limb dominant sports such as baseball or hockey. Hence the common term "Little league elbow". In the elbow, the most common area affected is the capitellum, although it has been reported to affect the olecranon and the trochlea. OCD can mean one or more flakes of articular cartilage have become separated. Which form loose bodies within the joint. The separated flakes can then ossify due to nourishment by the synovial fluid. The cartilage is damaged and can form a loose body. In the long term OCD can lead to subsequent degenerative arthritis or osteoarthritis. Involved anatomy of this disorder includes the radial head or the central and/or lateral aspect of the capitellum. Most OCD lesions of the elbow involve the capitellum, typically the central or lateral portion, but also the radial head, the olecranon of the ulna and the trochlea humeri. Ostechondritis of the humeral capitellum is secondary to repetitive compression forces between radial head and capitellum. Repetitive high stress forces on the joint can result in a series of minor injuries on the elbow that can eventually lead to bony fragmentation and ultimately detachment of the bony fragment from the bone. Commonly seen in the adolescent sporting population; who partake in repetitive throwing or overhead activities such as baseball and gymnastics. More frequently seen in males (ages 10-14) than females and often affecting the dominant arm. The cause of OCD is likely multi-factorial. Causes of this pathology normally include injury or repetitive stress on the joint, lack of blood supply, and/or genetic makeup. Some other mechanisms that can contribute to the development of OCD are: trauma, ischaemia, disordered ossification and genetic abnormalities. However, these mechanisms are not universally accepted but may be a contributing factor. Vascular hypo perfusion and repeated micro-trauma may also contribute to the development of OCD. Capillary blood supply is often limited to 1 or 2 end vessels with limited collateral flow. This leads to vascular hypo perfusion. Repeated micro-trauma could lead to a production of a relatively avascular state in the vulnerable immature capitellar chondroepiphysis. Radiographs can detect any abnormalities on the surface of the joint. Radiographs and MRI can also confirm diagnosis, monitor progress and assess for potential surgical intervention. X-ray can show if the cartilage flake includes a piece of underlying bone. Magnetic Resonance Imaging (MRI) will show any accumulation of fluid in the area and can detect any loose fragments. MRI should be considered when symptomatic patients have a normal X-Ray. Computerised Tomography (CT) can detect any bony fragments, pinpoint their location and determine whether they have settled in the joint space. An outcome measure appropriate for this injury is the DASH questionnaire which measures disabilities of the elbow, shoulder and hand as they relate to everyday function. Additional measures may be required in terms of return to sport, especially in professional level sport. OCD can be managed conservatively or surgically. Surgical management may be necessary if conservative care fails, if the lesion is Grade III or higher, or if disruption of the cartilage cap continues. Conservative management may not always be successful even in Grade I lesions and should be re-assessed regularly. In some cases a large fragment may need to be re-attached to the capitellum which will be done via K wire or screw fixation. In severe cases osteochondral grafting may be required. The initial stage should be focused on advice, education and pain management. This can be through use of NSAIDs, activity modification, cessation of sports and/or bracing for 6-12 weeks. 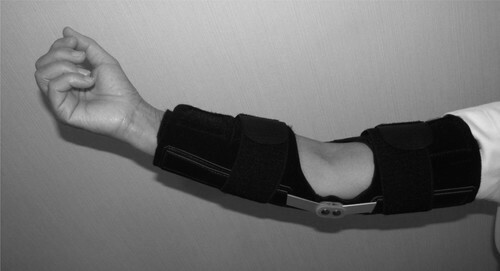 A hinged brace can be used to help offload the joint and any valgus pressure. This can be set to any pain free ROM and gradually increased as swelling and symptoms decrease. When pain has settled, management would be to gradually introduce full ROM and strengthening exercises out of a painful range. The patient can start return to play exercises as long as symptoms are not an issue. At three weeks post operatively ROM and gradual strengthening may be commenced however; this may vary depending on consultant preference. Some post operative protocols state no strengthening exercises until three months. Return to play will depend on sport and pain. Athletes have the potential to return to their pre-injury level if motivation and compliance with rehabilitation allows. Osteochondritis Dissecans is, in adolescent athletes, an increasingly common cause of elbow dysfunction and elbow pain. It can eventually lead to osteoarthritis and other elbow pathologies if not treated. The mechanisms of injury can be multi-factorial but most common in the young sporting population. OCD occurs when one or more flakes of articular cartilage separates and forms loose bodies within the joint. The separated flakes remain alive and frequently ossify causing popping and crepitus. Examination can be done using the active radiocapitellar compression test, in case of lateral joint pain evocation the test is considered positive. For medical management, the use of arthroscopic surgery is the main route of management to remove the bony fragments. Physiotherapy post-operative management is fairly standard and will vary depending on consultant preference, however, conservative management mainly reports to avoid symptoms and aggravating activities until the bony fragments have healed. ↑ Folio LR, Craig SH, Wright GA, Battaglia MJ. Loose body in elbow of a baseball player: arthroscopic/radiologic correlation. Radiology case reports. 2006 Jan 1;1(2):62-5. ↑ 2.0 2.1 2.2 2.3 2.4 2.5 2.6 2.7 2.8 2.9 Giuseffi SA, Field LD. Osteochondritis dissecans of the elbow. Operative Techniques in Sports Medicine. 2014 Jun 1;22(2):148-55. ↑ 4.0 4.1 4.2 Klingele KE, Kocher MS. Little league elbow. Sports Medicine. 2002 Dec 1;32(15):1005-15. ↑ 5.0 5.1 5.2 5.3 Baker III CL, Romeo AA, Baker Jr CL. Osteochondritis dissecans of the capitellum. The American journal of sports medicine. 2010 Sep;38(9):1917-28. ↑ Curry H. Essentials of Rheumatology. 1st ed. Churchill Livingstone; 1988. ↑ 7.0 7.1 7.2 Matsuura T, Suzue N, Iwame T, Nishio S, Sairyo K. Prevalence of osteochondritis dissecans of the capitellum in young baseball players: results based on ultrasonographic findings. Orthopaedic journal of sports medicine. 2014 Aug 11;2(8):2325967114545298. ↑ Zbojniewicz AM, Laor T. Imaging of osteochondritis dissecans. Clinics in sports medicine. 2014 Apr 1;33(2):221-50. ↑ Brunton LM, Anderson MW, Pannunzio ME, Khanna AJ, Chhabra AB. Magnetic resonance imaging of the elbow: update on current techniques and indications. The Journal of hand surgery. 2006 Jul 1;31(6):1001-11. ↑ Moktassi A, Popkin CA, White LM, Murnaghan ML. Imaging of osteochondritis dissecans. Orthopedic Clinics. 2012 Apr 1;43(2):201-11. ↑ Schoch B, Wolf BR. Osteochondritis dissecans of the capitellum: minimum 1-year follow-up after arthroscopic debridement. Arthroscopy: The Journal of Arthroscopic & Related Surgery. 2010 Nov 1;26(11):1469-73. ↑ MacDermid JC. Outcome evaluation in patients with elbow pathology: issues in instrument development and evaluation. Journal of Hand Therapy. 2001 Apr 1;14(2):105-14. ↑ 14.0 14.1 Ruch DS. The arthroscopic management of osteochondritis dissecans of the adolescent elbow. Arthroscopy: The Journal of Arthroscopic & Related Surgery. 1998 Nov 1;14(8):797-803. ↑ Cain Jr EL, Dugas JR, Wolf RS, Andrews JR. Elbow injuries in throwing athletes: a current concepts review. The American journal of sports medicine. 2003 Jul;31(4):621-35. ↑ de Graaff F, Krijnen MR, Poolman RW, Willems WJ. Arthroscopic surgery in athletes with osteochondritis dissecans of the elbow. Arthroscopy: The Journal of Arthroscopic & Related Surgery. 2011 Jul 1;27(7):986-93. ↑ Takahara M, Ogino T, Fukushima S, Tsuchida H, Kaneda K. Nonoperative treatment of osteochondritis dissecans of the humeral capitellum. The American journal of sports medicine. 1999 Nov;27(6):728-32. ↑ 18.0 18.1 Bojanić I, Ivković A, Borić I. Arthroscopy and microfracture technique in the treatment of osteochondritis dissecans of the humeral capitellum: report of three adolescent gymnasts. Knee Surgery, Sports Traumatology, Arthroscopy. 2006 May 1;14(5):491-6. ↑ Jones KJ, Wiesel BB, Sankar WN, Ganley TJ. Arthroscopic management of osteochondritis dissecans of the capitellum: mid-term results in adolescent athletes. Journal of Pediatric Orthopaedics. 2010 Jan 1;30(1):8-13. ↑ 20.0 20.1 Maniwa S, Tadenuma T, Sakai Y, Aoki A, Yamagami N, Yamamoto S, Uchio Y. Elbow Brace Promotes Postoperative Rehabilitation of Osteochondral Graft in Young Athletes with Osteochondritis Dissecans of the Humeral Capitellum. Progress in Rehabilitation Medicine. 2017;2:20170002. ↑ 21.0 21.1 Ahmad CS, ElAttrache NS. Treatment of Capitellar Osteochondritis Dissecans. Techniques in Shoulder and Elbow Surgery 2006 7(4):169–174.